What better way to enjoy the chill evenings than to make some s’mores! These caramel s’mores pops take the classic recipe and adds a delicious twist with caramel. Not only are they a great snack, but they are also super easy to make and eat. Stick one a lollipop stick into each of the marshmallows, before you set them aside. In a bowl, microwave the mixture of caramel squares, butter, and sweetened condensed milk for 2-3 minutes. For each minute, stir the mixture. Place the chopped chocolate bars into another bowl, and microwave for 2 minutes. Every 30 seconds, stir the chocolate until completely melted. Pulse the graham crackers in a food processor, until the consistency is very fine and crumb like. Place this in another bowl, make sure it is shallow in depth. With the marshmallows, dip one side with caramel, and the other with chocolate, before you roll them in the graham cracker crumbs. Place each one on a wax paper lined baking sheet, before you continue with the other marshmallows. That’s it! 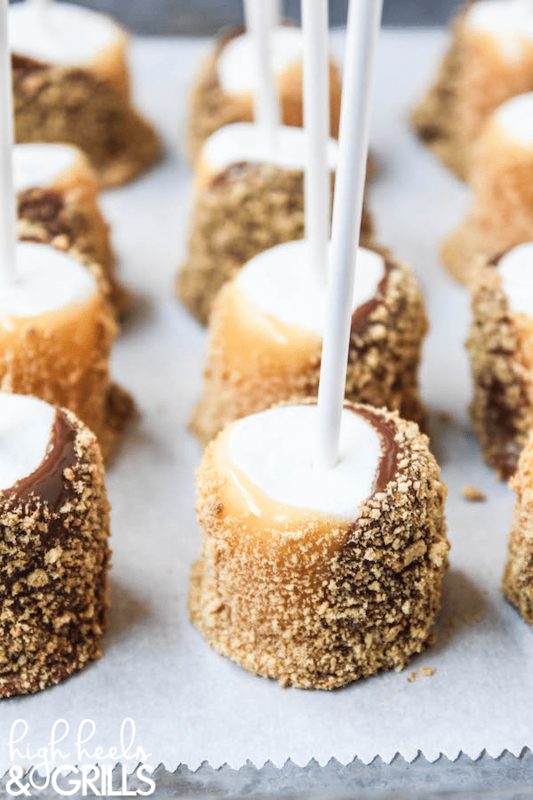 You don’t even have to go outside to make these delicious caramel s’mores pops. What are some of your favorite fall snacks?